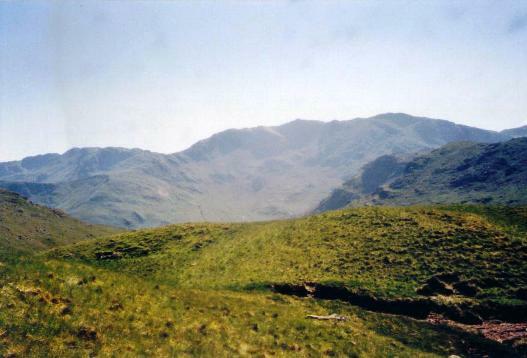 This promised to be the best day on the Cumbria Way as it involved walking almost the full length of beautiful Borrowdale and then the wild and remote Langstrathdale before crossing over Stakes Pass into Great Langdale. The weather was good, and the walk certainly lived up to expectations! No minibus this morning, as we walked straight from our hotel. The first part of the walk was very pleasant and scenic, as we followed the western edge of Derwent Water. On this mainly wooded section, we came across a large group of walkers heading in the opposite direction - their leaders were quite unfriendly, ignoring our greetings, but someone at the back of the group stopped to chat. They were doing the Cumbria Way in the usual south to north direction with a rival organisation, the Ramblers, but they had been on holiday with HF before so commented on the fact that we must be well fed (which was certainly true!). From the end of Derwent Water, we then walked further south into Borrowdale, across fields and down lanes and tracks, often close to the river Derwent, until we reached Grange. Here we stopped for a break, most people taking advantage of one of the tea shops while I just sat and reflected by the twin bridges over the Derwent. From Grange, we continued down Borrowdale in very sylvan surroundings, passing between Castle Crag and Grange Fell, the ‘Jaws of Borrowdale’. Patience told us about Millican Dalton, an eccentric gentleman who had lived in a cave on Castle Crag during the early part of the 20th Century. After crossing the river Derwent on an old arched bridge, we eventually reached the village of Rosthwaite. Here we crossed the road and continued on footpaths round the edge of the ‘intake’ walls, heading towards Stonethwaite although not actually passing through it. It was near here that we stopped for lunch, sitting on rocks near the bottom of a hillside amongst some very large boulders. While we were eating, we saw a Buzzard passing overhead. After lunch, we crossed a bridge over a beck and started off down Langstrath, very appropriately named as it is indeed a ‘long valley’. Here we could really feel as if we were in one of the wilder parts of the Lake District, as for several miles there were no signs of habitation, just the occasional sheep and a few fellow walkers. The walk along the valley floor was flat but bouldery in places, with steep, rugged hillsides on both flanks of the valley. Eventually, we left the valley floor and headed up the steady climb of the Stakes Pass. We stopped for a breather and some water about halfway up, before setting off again. As with High Pike, we each took it at our own pace with some a bit slower than others, and we finally managed to reach the top of the pass where we again stopped for a breather. The views here were glorious, especially looking towards Bow Fell and Crinkle Crags across Great Langdale. The descent of the other side of Stakes Pass was much easier on our hearts and lungs than the ascent had been, and we soon reached the valley floor in Mickleden (part of Great Langdale), where we followed a clear track for a couple of miles to reach the Old Dungeon Ghyll hotel. After a long day, the half-mile path from there to the New Dungeon Ghyll hotel seemed to have some unnecessary climbs in it, plus a tricky descent over rock, but we all made it safely to our destination. As this was the day we changed hotels, some of us needed to go back to Portinscale to collect our cars. A minibus-taxi took us there, via the steep Red Bank short cut that missed out Ambleside. As some people weren't sure of the way to Coniston, I ended up leading a convoy of four cars there – amazingly, I didn’t lose anyone on the way.